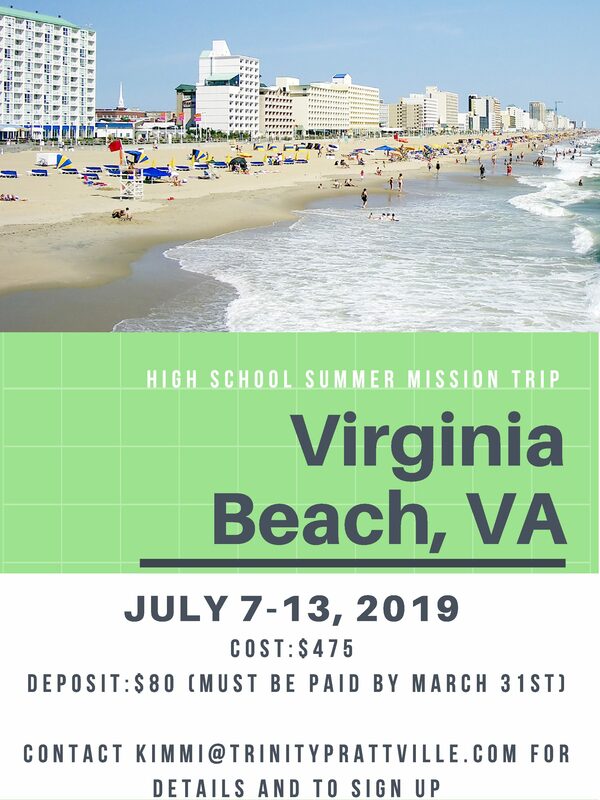 This summer our High School Students will be going to Virginia Beach, VA. We will have the opportunity to work within this community to help with some very necessary home repairs. While we are there we will also partake in nightly worship with the Team Effort staff. We also have some fun opportunities built in at the end of the week where we will be going to the beach for our half day of fun on Thursday, and to Busch Gardens on our full day of fun on Friday. The cost of the trip is $475 and this includes everything except for the meals on travel days, one lunch while we are on the trip. (5 fast food meals total) Please note that an $80 deposit is due by March 31st to hold your spot. (We understand this date is fast approaching, so if this an issue for your family, just let Kimmi know.) We cannot garuntee a spot for you after that date has passed. This deposit may not be paid out of the youth fundraising money, but the rest of the trip may be. To sign up please contact Kimmi, and she will get yout he necessary forms for the trip!